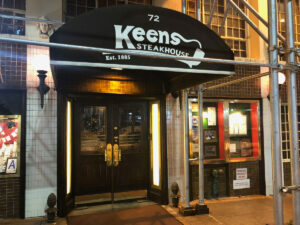 Shouldn’t it be Keen’s Steakhouse, like with a possessive ‘s’? And who is this Keen dude? And why is he so obsessed with oldie timey churchwarden pipes? Like obsessed enough that the entirety of the huge, meandering space’s ceiling is covered with them? 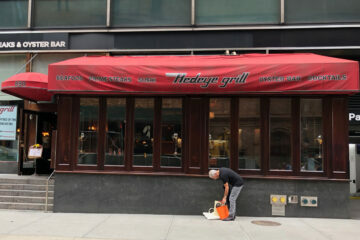 It’s a really, really odd feature, but one they market on their awning and at least adds some character to a restaurant that honestly doesn’t really need much more character. I’ve been to a bunch of steakhouses around NYC. This is one of the oldest, although I’m not certain it’s thee oldest. There seemed to be some hedging there from several folks, but I think Old Homestead beats it out by fifteen years or so. 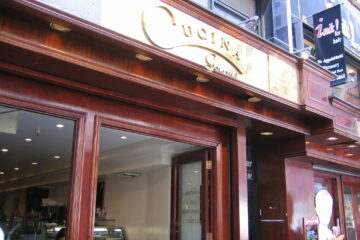 That said, this joint clearly has some age to it. It’s everything that I thought Old Homestead was going to be, but totally wasn’t. It has all the casual old-world, steakhouse accoutrement that doesn’t fancy it up, but retains that overcrowded, Victorian charm with almost folk-arty looking paintings of British dudes and framed, yellowing documents and all sorts of knick-knacks and stuff. Sure, there are white table clothes, but they are there just to set off the red of the bloody steaks. And the waiters are dressed up, but it’s workmanlike and not stuffy. The whole restaurant is a meandering maze of stairs leading to rooms filled with post-work dudes in suits, tourists in shirtsleeves and guys like me who just love to eat a cow with a bottle of red on a weeknight. If you’ve been to any of the other 1880s NYC establishments like Pete’s Tavern or PJ Clarke’s, then you kind of get the vibe here. It’s loud and lively, but not in an obnoxious, modern kind of way. After all, all that wood makes for a really decent sound absorber. But it definitely feels like folks are having a good time diving into their food and getting into the spirit of the, uh, spirits. But, honestly, we’re all here for the meat. And the worry is — or at least my worry generally is — that this is exactly the thing that will disappoint. Especially when that chunk of meat costs $54. I went for the dry-aged New York strip. I asked about the grass-fed option, which is a whopping three dollars more, but the waiter just kind of crinkled his nose at the thought. So I ordered it up medium rare with some sear with a double side of potatoes (fries and hash browns). I’m not sure what possessed us to order two tuber-related sides, but we were two guys and the place just engenders starch. My steak was pretty enormous. And it had a great char on the outside and was cooked perfectly with a great salty crust. At first I didn’t think I’d possibly be able to finish it, but then I remembered that I am a bottomless pit and I killed that thing, sopped up the blood with some fries and was completely and ultimately satisfied. Definitely one of the best steaks I’ve ever had. And I’ve been to Sizzler!